You are here: Home / Your Senior Bichon Frise’s Health / Are Bichon Frises Prone to Cataracts in Dogs? Are Bichon Frises Prone to Cataracts in Dogs? Cataracts in dogs are common, just like they are in older people. However, because dogs use their keen senses of smell and hearing to compensate, we often have trouble discovering that our dogs are losing their sight. Bichon Frises, like other dog breeds, can lose their vision because of cataracts. Because cataracts usually develop slowly, the changes in your dog’s vision will not be obvious to you, or to your dog. The lens of your dog’s eye is the clear soft and transparent tissue that sits behind the iris (colored part) of the eye. When a dog has cataracts, the lens becomes cloudy and that makes his vision blurry and less bright. When your dog has cataracts, the lens in her eye gets cloudy. If the cataract continues to mature, your dog could eventually be blind in that eye. As your dog ages, she is more likely to have cataracts than when she was young. Do Cloudy Eyes Always Mean Cataracts? How are canine cataracts treated? What are canine cataracts and who gets them? When you look at the diagram of an eye above, the lens is a clear part of the eye in a healthy dog’s eye. As a dog ages, the lens sometimes becomes cloudy or opaque, and this blocks light from reaching the retina of the eye. When the light is blocked from reaching the retina in your dog’s eye, he loses part of his eyesight or vision. Depending on how cloudy the lens gets, your dog can have slight vision problems or he can become blind. 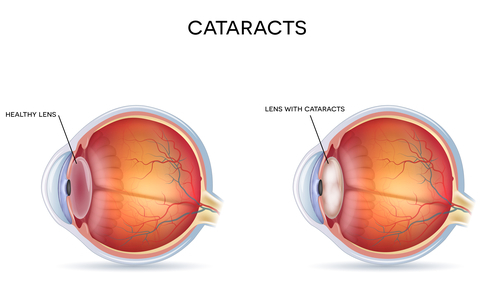 Cataracts usually start small and increase in size over time. When they are still little, canine cataracts do not really impair a dog’s vision. But the longer a dog has cataracts, the more mature they become. And, as they mature, the lens becomes more and more cloudy. Eventually, with a mature cataract, all vision is lost. Most cataracts in dogs are inherited. And the dog breeds that are most likely to have inherited cataracts are listed below, with the age that they are usually first seen. When dogs are born with cataracts, the cataracts may get smaller as the dog grows and the lenses on his eyes get larger. In that case, the dog’s vision will get better. Most cataracts are present when the dog is born. They can grow and become an issue at any age, but often we see cataracts growing and impairing vision as a dog becomes an adult or a senior. The second most common cause of cataracts is diabetes mellitus. If your dog has been diagnosed with diabetes, you should be especially vigilant. In dogs with diabetes, 75% develop cataracts within 9 months of being diagnosed with diabetes. And diabetic cataracts develop and mature fast – sometimes overnight! Cataracts in dogs who are diabetic can be a medical emergency. But, if your dog is diagnosed with diabetes, acting quickly, you can actually prevent the formation of cataracts. If you give your dog Ocu-Glo supplement, a product developed by two ophthalmologists, you can help prevent diabetic cataracts from forming. Other diseases of the eye – Sometimes dog cataracts develop when there is another eye problem that weakens the eyes. These include retinal degeneration or progressive retinal atrophy, uveitis (inflammation in the eye) and glaucoma. Trauma – If your dog’s eye was injured, it will be more likely to get cataracts. If your dog has an eye injury, do seek medical attention right away from your vet. Nutritional deficiencies – If your dog is not getting everything she needs in her dog food, cataracts can develop. This can even happen with puppies, but they often get better as they grow. Age-related cataracts – Dogs over 8 years old often develop cataracts. The cataracts often stay small and, in that case, do not cause blindness. Radiation – if your dog has been treated for cancer, in the head area, he may get cataracts from the radiation exposure. Cataracts grow at different rates. Some fast. Some slow. Your little Bichon Frise dog may develop cataracts after she has reached the age of two. The type of cataracts that Bichons get, they tend to develop fast and they cover the whole eye lens. That means that they can lead to total blindness. And if they have a cataract in one eye, Bichons usually also have a cataract in the other eye. Bichon Frises who are older than 8 years old start to have a hardening of their eye lenses. This is similar to what happens with people who are over 40 years old. Near vision becomes blurry, and we all seem to need reading glasses at the same age. When this happens with your dog, the lens will have a grayish cast. This is called nuclear sclerosis or lenticular sclerosis. It does not interfere with your dog’s vision, and light can still get through the lens to the retina. Your dog never had good vision for close-up objects, so she won’t notice any difference. You won’t be able to tell the difference between nuclear sclerosis and cataracts, and a regular vet probably won’t either. But, if your vet suspects cataracts, she may refer you to a specialist, a veterinary ophthalmologist who specializes in diseases of animal eyes. To make things even more complicated, your dog can have cataracts AND nuclear sclerosis at the same time. There are a few options for treating cataracts in dogs. I’ll look at each below and tell you the pros and cons of each approach. With people, cataracts are usually removed. When removed, the lenses are replaced by artificial lenses, and sight is restored. With dogs, it’s not quite so simple. Not all dogs with cataracts need to have them surgically removed. In most cases, the cataracts are small and your dog still has fairly good vision. Her life is relatively short, and the cataracts may never reach maturity. When a dog has cataract surgery, it is to improve his vision and his quality of life. If your dog is old and has also lost her hearing or has dementia, having sight restored can be wonderful for your dog. 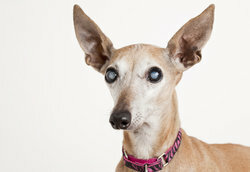 This Italian Greyhound has cataracts on his eyes. Notice the cloudiness of his eyes. Cataract surgery is just like cataract surgery for humans. The lens is removed and then replaced with an artificial lens. Eye surgery is delicate surgery, and your dog will be under general anesthesia. If both eyes have cataracts, your dog will have surgery on both eyes at once. Surgery for cataract removal in dogs is very expensive. It can easily cost $3000 per eye, and it probably will not be covered by insurance. Many insurance companies consider cataracts in dogs to be normal for aging dogs and they will have an exclusion for cataracts written into their policies. Most dogs will have close to normal eyesight after surgery. However, dogs do have more inflammation in their eyes after surgery than people, and that can cause scarring. Scarring will mar your dog’s vision somewhat. After surgery, you will have to put drops in your dog’s eyes, to cut down on scarring and prevent infection. But the good news is that your dog will never have cataracts again. Even if your dog is one of the few who become blind because of cataracts, she will probably adjust to being blind better than you would think. When you make simple adjustments to your home and work with your dog, she will be just fine, knowing that you are close and there to help. There are two additional things that you can do to help your dog. Ocu-GLO is a supplement developed by two ophthalmologists, and it is best used routinely with a dog like the Bichon Frise, who is prone to getting cataracts. Ocu-GLO serves as a preventative measure for dogs that don’t yet have a problem and it can also help prevent canine retina issues after cataract surgery. This supplement is the only supplement made for dogs’ eyes that has research and clinical studies to back it. If you decide not to have surgery for your dog or you want to prevent eye problems, Ocu-GLO is certainly worth looking into. In some studies, when this product was used, cataracts were almost reversed, something unheard of before this! Not cheap, it’s certainly a lot less expensive than cataract surgery! Bright Eyes Drops (seen on UK National TV on the Richard and Judy TV Show) can also be used with your dog if you are not going to pursue surgery. This product has also been tested, with good results. Bright Eyes drops are eye drops that you put into your dog’s eyes. They are used for dogs with cataracts, glaucoma, macular degeneration and for dogs who are diabetic. Nothing used for dog cataracts is cheap, and that is also true for these eye drops, as well. When you suspect that your dog has cataracts, the first thing to do is have her checked by your vet. If he agrees that she may have cataracts, he may refer you to a specialist. If your dog does have a diagnosis of cataracts, you will need to decide how much you can afford to spend, and which approach seems reasonable, based on your dog’s age and general health.